After you have customized your time tracking views regarding your personal needs, you can save those views for a later time. 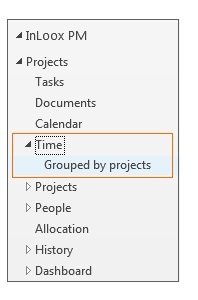 The time tracking view within a project automatically saves your adjustments. When you are opening the project the next time, your customized view will be automatically displayed. In the time tracking overview over all projects you have to save your customized view. By saving a customized view you can make it accessible for other users. How to save your customized view in the time tracking overview over all projects will be explained in the following step-by-step. 1. Open the InLoox now or InLoox PM tab and then click on Time. The time tracking overview over all projects opens. Customize the view regarding your needs (For more information on that topic read Customize time tracking views). 2. To save the customized view, open the Start tab and click on Save and then on Save current view. 3. Name the view (e.g. Grouped by projects) and activate the check box Visible for all users, if you want to make your view accessible for other users. Then click on OK.
4. You can find the view in the tree structure on the left side directly below time. Save customized views | InLoox 9 for Outlook • Copyright 1999-2019 © InLoox, Inc. All rights reserved.